Thanks to her graphic prints and tongue-in-cheek designs (think teddy bear backpacks and shark handbags), Westminster grad Ashley Williams has earned the reputation of London Fashion Week’s queen of kitsch. She’s also known for toying with different types of femininity which, this season, resembled something akin to an Avril Lavigne-Winona Ryder hybrid. 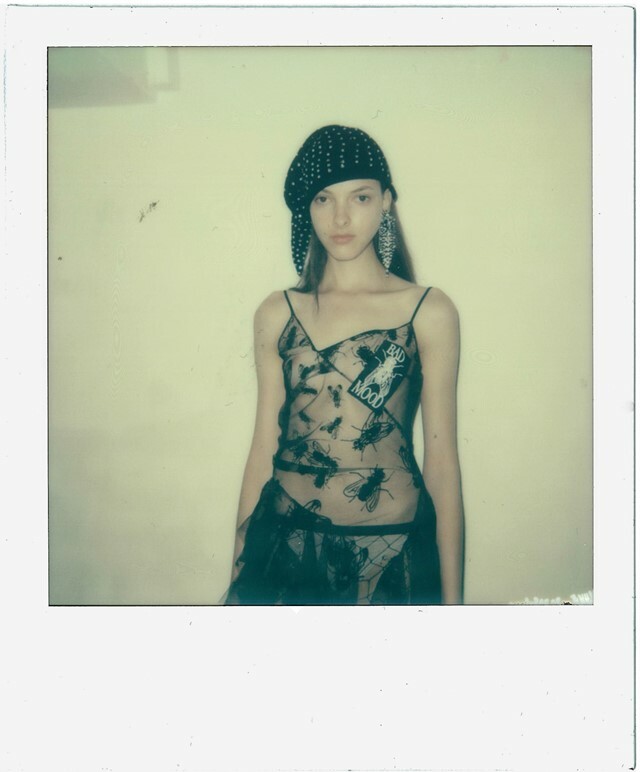 Backstage at her LFW show, the Fashion East alumnus described her SS16 girl as feeling angsty, after unveiling a collection that was a lot darker than her usual offerings. This came across very literally, with the words “BAD MOOD” appearing on clothes, along with graphics of flies and goat skulls. Dubbed “beautiful carcasses”, her models wore The Brides of Dracula-esque tiaras, Marilyn Manson inspired make-up and Emily the Strange stripes; all of which culminated in a certain Camden Market gothicism. Tattoo-covered, purple-eyed and self-described “alien” Grace Neutral also made an appearance in the show, capturing the spirit of this collection. But don’t be fooled, this wasn’t a different Ashley Williams girl, just a different side of her. Check out the gallery above for some behind the scenes shots of the show. Camera and film courtesy of The Impossible Project. See the collection in full colour below and head to @DazedFashion for more insider moments from fashion week.